But Anne did know what to say. A popular novelist, essayist, memoirist and political advocate, she has been inspiring people with her words for more than twenty years. Tell them the truth, Anne reminded herself. Start where you are. Breathe. Stitch things together. 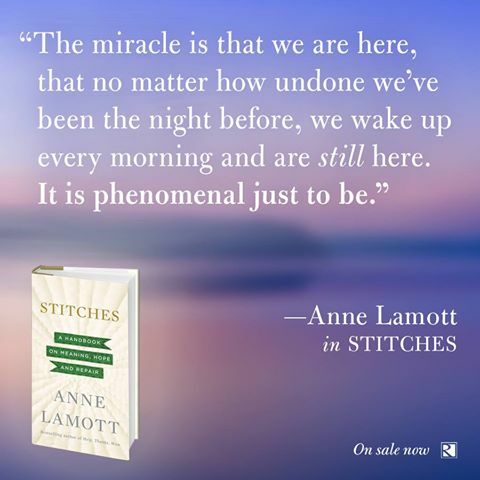 And so Lamott’s latest book, Stitches: A Handbook on Meaning, Hope and Repair (Riverhead Books), was born. Go figure, indeed. Stitches may have been an accident, but Lamott’s devoted readers eagerly awaited every word. 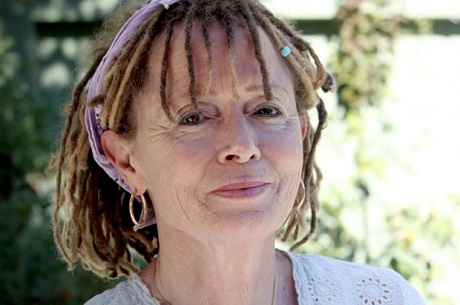 Her 62,000 Twitter (@ANNELAMOTT) followers and nearly 147,000 Facebook friends write things like “You are truly inspiring and making me feel safe to shine” and “I need your wisdom like a blood transfusion!” and “YAY!!!!! My preordered Stitches just appeared in my iBooks!!!!! HAPPY TUESDAY!!!! !” They love her. What is it that they are getting from her? The writers in the audience, myself among them, have long appreciated Lamott’s wise counsel in Bird by Bird: Some Instructions on Writing and Life. We like seeing her onstage, wearing the exact same twisted lilac bandana and white moon and star necklaces she wore recently on Oprah’s Super Soul Sunday, telling us what her writing life is like. 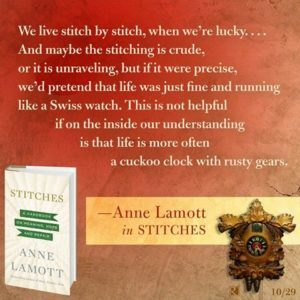 Anne tells us those stories. Stories about getting lost: “I’m always lost. My son got me GPS and OnStar, but I hate to bother them.” And there are her stories about growing older: “It all goes so fast! I’ll be 60 next year—I’ll be fifty-ten next year.” And stories about stitching things back together, about offering “just a couple of stitches for that very torn, raggedy day.” This book may have been written by accident, but readers are grateful for the compassion and understanding that it offers. We’re looking forward to Anne joining us on TWE Radio in December. Podcasts will be available and the interview with Stacey will be on iTunes.